Zmodo Sight 180 C Home Surveillance Camera. With a HD 1080p resolution, 180° angle of view, Full Duplex Two-Way Audio and Customized Motion Detection Area, you won't miss any moment of your home. 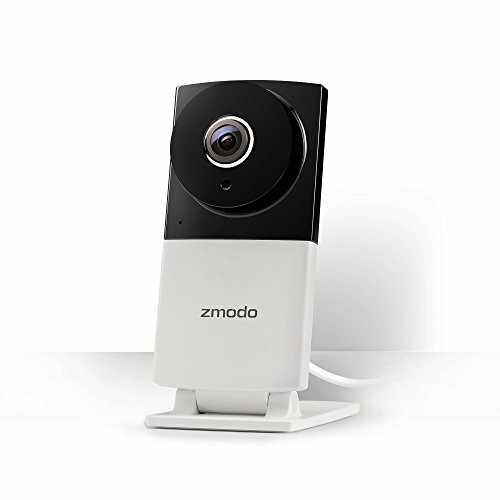 With Zmodo App, you can have live view of your camera remotely at any time, and receive alerts with a short video clip whenever motion is detected. 180°VIEWING ANGLE: The 180°viewing angle and 1080p HD resolution give you a larger view of your home with crisp and clear details. Night-vision settings allow you to turn on, off, or adjust the sensitivity of the IR lights so that you can obtain the perfect picture of your home, day or night. WORK WITH ALEXA: Zmodo wireless indoor camera is compatible with Echo Show for voice control. (Alexa device sold separately). Please check and update your product to the latest device version in order for it to interact with Amazon Alexa. TWO-WAY AUDIO: Use the two-way audio to speak through your wireless camera, loud and clear. The wireless home camera can help you remind your kids to finish up their homework, tell Sparky to get off the couch, or give the babysitter last minute instructions. The anti-noise microphone and loud speaker are optimized to ensure for easy listening and conversation. INSTANT ALERT: The home indoor camera is easy to install and connect stably. Receive motion video clip alerts on your phone when something is detected. Customize your alert schedules with home/away/sleep modes, motion detection zones, and more. The indoor security camera will send you real-time Activity Alerts while you're out. CLOUD SERVICE: All users are eligible for a 1-month free cloud of our 7 day cloud recording plan. With the plan, you can review, save, and share footage at any time, and reduce false alerts with cloud intelligence.